What makes Madagascar so special? – The amazing biodiversity. It is home to many strange and wonderful wildlife. Interestingly, the majority of them found nowhere else in the world. Here the list of 10 amazing animals found only in Madagascar. With a total population under 100, the Madagascar Pochard is the rarest duck in the world. They are endemic to the marshes and freshwater lakes of Madagascar. This extremely rare species of duck is thought to be extinct for many years. But in 2006, around 20 Madagascar Pochards were rediscovered at lake Mastsaborimena. In the same year, the Durrell Wildlife Conservation Trust and Wildfowl and Wetlands Trust initiated a breeding program. By 2013, the researchers have been successfully raised the population of the Madagascar Pochard to 80 from just 20. The initial declination in the population of Pochard duck is caused by the loss of nesting sites and by the introduction of new species to their habitat. Still, the Pochard ducks are vulnerable to extinction due to the scarcity of food within their habitat. The International Union for Conservation of Nature and Natural Resources (IUCN) classified the Pochard duck as a critically endangered bird. 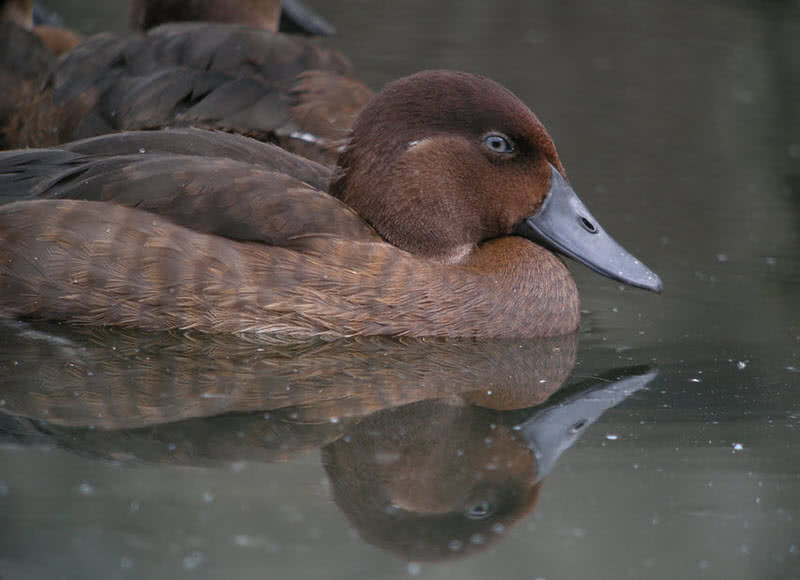 Madagascar Pochard is a medium sized duck, which, grows to 45-54 cm in length. They have attractive reddish-brown flanks, white belly and greyish beak. Pochard ducks have originally lived in the marshes and densely vegetated lakes of Madagascar. Today, the small remaining population of Pochard ducks faces the scarcity of food. Without proper rescue plans, they will soon disappear from this world. Giraffe weevil is a strange looking insect that endemic to forests of Madagascar. The giraffe weevil called so because of its enormously long neck. A male giraffe’s weevil’s neck is 2-3 times longer than the female’s. The male insects use their long neck to build nests and to compete with other males during the mating season. With an average length of 2.5 cm, the giraffe weevil is among the largest insects of the weevil family. Most of the body parts of giraffe weevil are black. The most noticeable thing on giraffe weevils, other than its long neck is the red shell that covers their hind legs. It called as elytra. The giraffe weevils use these shells along with hind wings in flight. At present, a large population of giraffe weevils lives in the forests of Madagascar. They spent most of their lives on small trees known as ‘giraffe beetle trees’. They also feed on leaves of these trees. Luckily, there are no known predators to the giraffe weevils. 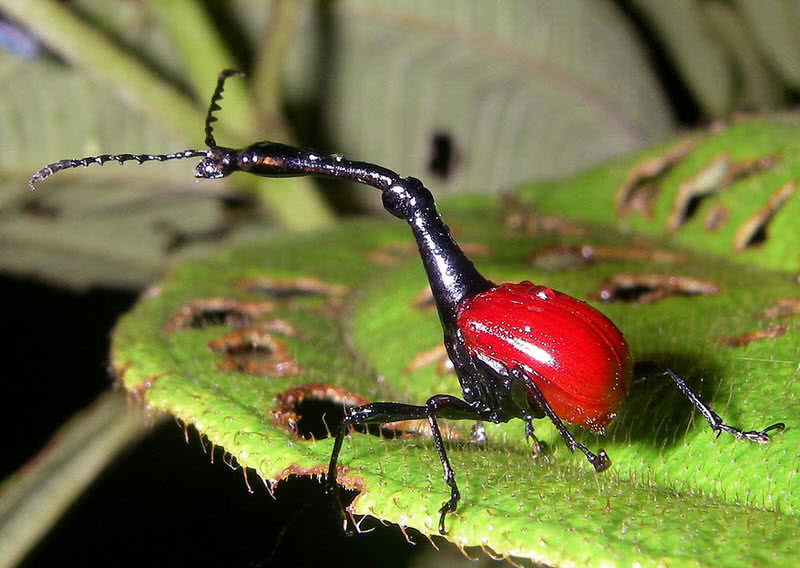 Unlike their strange look, the giraffe weevil is completely harmless. They show no aggression towards human or other species. With a size of a house cat, the panther chameleon is among the largest chameleons in the world. 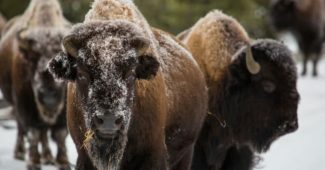 They measure 17-20 inches in length. This large species of the chameleon is native to the Madagascar Island. 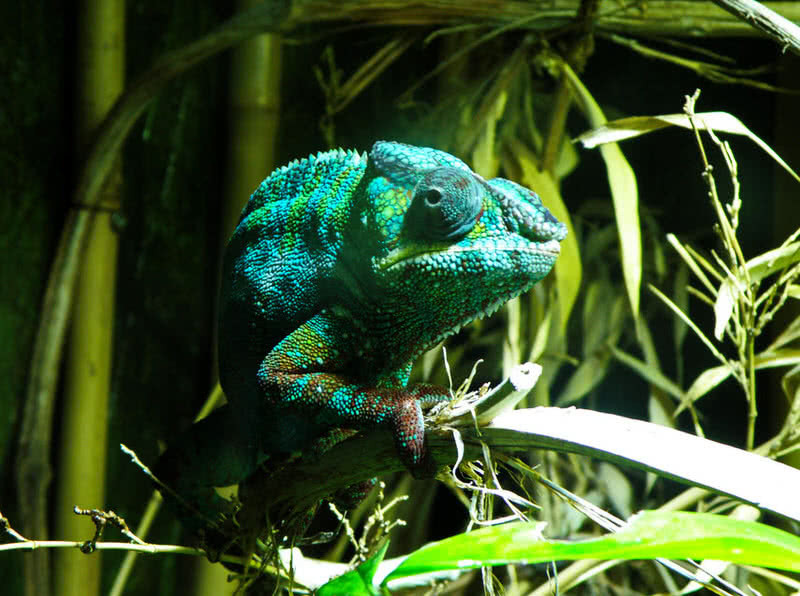 The panther chameleons are also famous for their striking technicolor skin. Panther chameleons inhabit in the coastal areas and islands of central and Northwestern parts of Madagascar. The color pattern of their skin varies with the location they live in. The skin color ranges from orange, red, blue, dark green or blue-green with different stripes and spots. The male panther chameleons are more colorful than the females. Panther chameleons have the power to change their color with incredible speed. This spectacular color changing doesn’t merely depend on the change of location. It is also affected by their state of emotion, health, temperature variation, and light intensity. The male panther chameleons display such an amazing skin color transformation during breeding season or on defense. The female chameleons usually have a dull color of gray or brown. But, during breeding season they also become pale or orange to pink in color. Tomato frogs are named after their vibrant orange-red colored skin. Only the female frogs have such a brilliant tomato like coloration. The male frogs have a duller brownish-orange color. 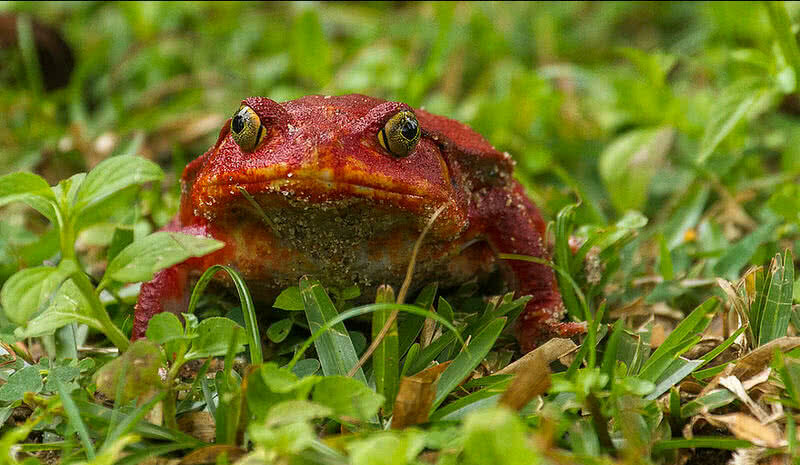 Undoubtedly, tomato frogs are one of most colorful animals in the world. They only found in the forests of Madagascar Island. In Madagascar , the tomato frogs inhabit in swamps, shallow pools or other wetter part of the Island. The brilliant coloration of tomato frogs is actually a warning to their predators. But tomato frogs are not so toxic. When threatened, their skin produces a thick, sticky fluid to deter the potential predators such as snakes. The tomato frogs are ambush predators. That means, they sit in a particular spot and will make a surprise attack on their preys. The diet of tomato frogs mainly includes insects and small invertebrates. Sifaka is an attractive species of lemur that found only in the Madagascar Island. 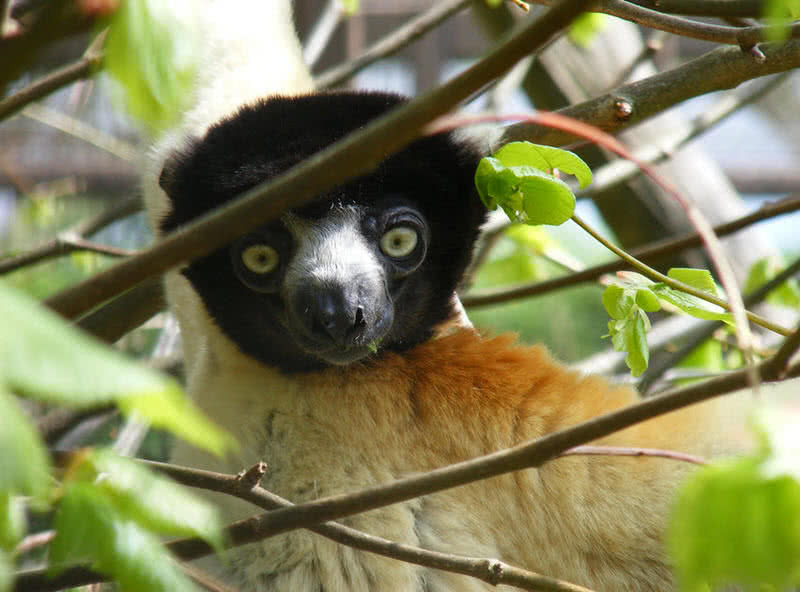 According to the native people the sifakas are called so because of their distinctive ‘shif-auk’ call. There are three main types of Sifakas – golden crowned sifaka, coquerel’s sifaka and diademed sifaka. They are one of the most endangered species of Madagascar. The habitat loss is the main threat faced by the sifakas. Sifakas are medium sized primates with a body length between 16-22 inches and weigh up to 6 kg. The long, silky fur is the most distinguishing feature of the sifakas. The color of the fur ranges from black, golden, white and grey. The sifakas are tree-dwelling animals. They spent most of their lives on tree branches. They can easily jump between the tree branches with their powerful hind legs. Sifakas usually found in small groups that contain 6-10 members. They mainly feed on fruits, leaves and buds. Madagascar is renowned for being home to cat-like primate called lemur. There are 50 different types of lemur live in the forests of Madagascar. 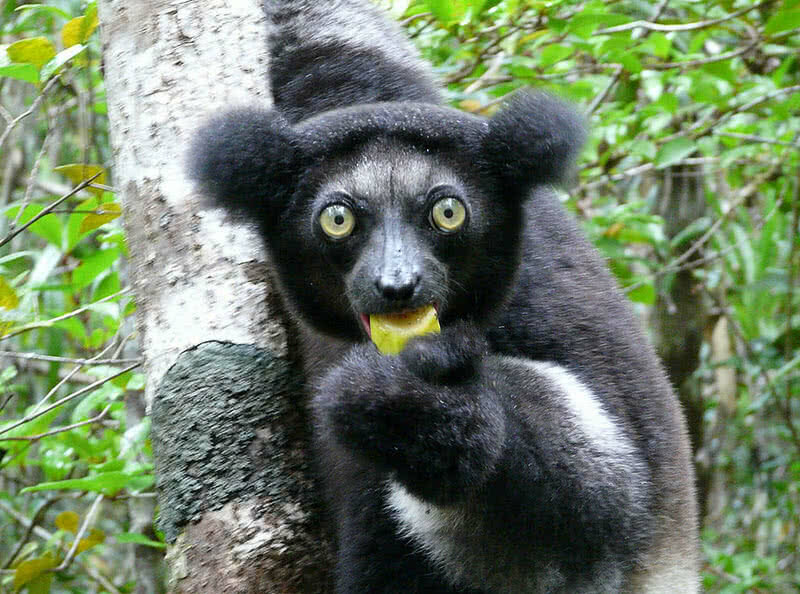 Indri is the largest of all lemurs found in the Madagascar Island. They have a body length between 22-28 inches and weigh up to 10 kg. Indris are also one of the endangered species of lemur with a population less than 10000. The indris inhabit in the rainforests of Eastern part of Madagascar. They live in small groups that include 4-8 animals. Indris are renowned for making high pitched calls. They make such calls to communicate with each other. These calls are loud enough to hear from miles away. Like the sifakas, the indris spend most of their lifetime on trees. They are arboreal primates, means specially adapted to move between the trees. Indris have powerful legs and big toes that give a strong grip on grabbing the branches of trees. This amazing lemur can cross a distance up to 10 meters in a single jump. The fossa is the largest carnivore found only in the forest of Madagascar. This mammal can reach 6 feet in length and weigh up to 10 kg. 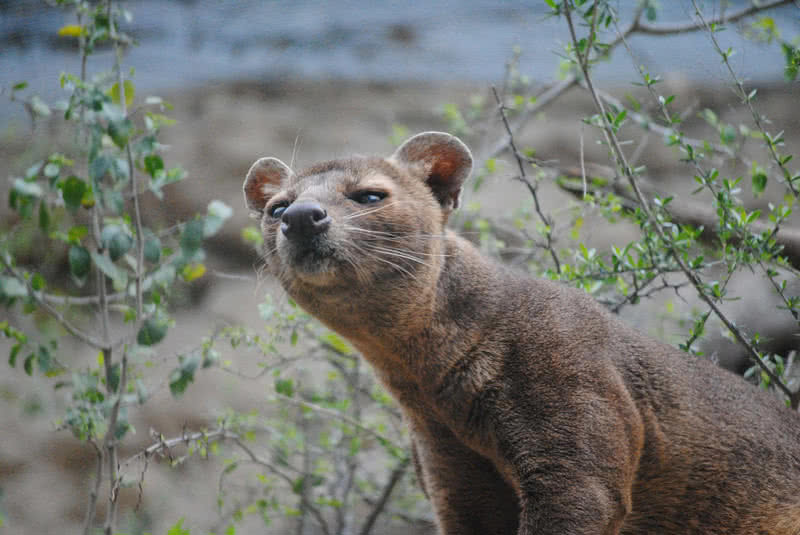 At first look, the fossa give a glimpse of a cross between a mongoose and a cat. The fossas are also the top predator of Madagascar. Unfortunately, only a small population of Fossas are left in wild in the Madagascar. The habitat loss is the main cause of declination of fossa’s population in Madagascar. The fossas have very strong, muscular body with short reddish-brown coat. The long tail is one of the most distinguishing features of fossas. The tail actually makes up almost half of the total length of a fossa. The fossas are very agile climbers. The retractable claws and flexible ankle joints allow them to easily climb up on the trees. The long tail of fossas also provides them right balance on move along the tree branches. Like the humans, the fossas walk on the soles of their feet, one kind of locomotion known as ‘plantigrade’. It gives the fossas stability in jumping from branch to branch. The fossa is the most efficient hunter among the Madagascar animals. It is an ambush predator, make surprise attack on its preys. The fossas hunt during both day and night. With the sharp claws and sharp tooth, fossas can quickly kill their prey. Lemurs are the main food of fossas. They also hunt on other small mammals, fishes, birds, frogs and lizards. Aye-aye is the largest nocturnal primate in the world. They can be only found in Madagascar. They are dark-brown in color and have large eyes and slender fingers. All these make aye-aye looks so scary. Although, they are very gentle and harmless. But many people kill them on sight because of their scary appearance. Such hunting and habitat loss make aye-aye as one of the endangered animals of Madagascar. Aye-aye inhabits in the coastal forest of Madagascar. It is a tree-dwelling animal and avoid contact with the ground. They have very pointed claws on each of their fingers. It allows them to easily move between the branches. Aye-aye is a nocturnal creature and hunt only at night. During day hours, they sleep on the sphere like nest build on the tree branches. At night, they travel for more than 4 km in searching for food. 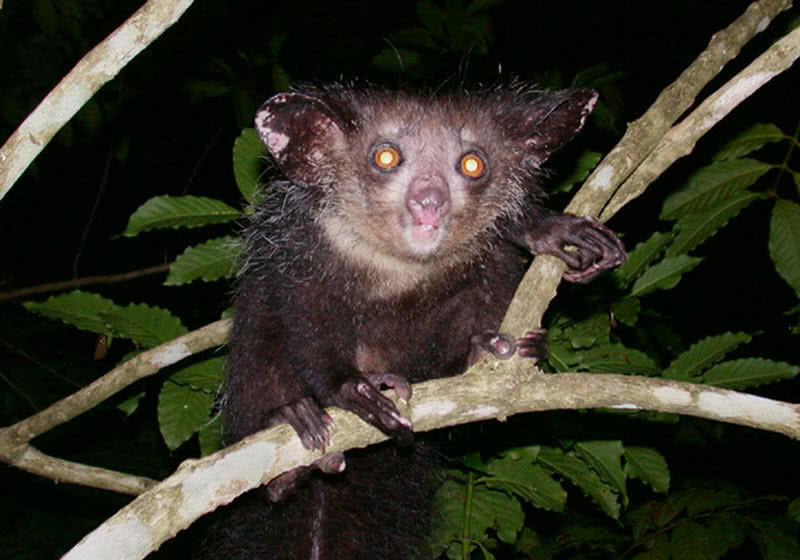 Aye-aye uses its large, sensitive ears to detect the wood-boring larvae and take them out with their elongated middle finger. The diet of aye-aye also include seeds, fruits and nectar. The satanic leaf-tailed gecko endemic to Madagascar is a master of camouflage. This amazing lizard can unbelievably camouflaged to resemble a dead leaf. Nobody can easily spot the leaf-tailed gecko when it’s resting over the leaf. This unique species of Madagascar can perfectly blend into its natural surroundings. The satanic leaf-tailed gecko only has a length between 10-15 cm. The coloration of leaf-tailed gecko is amazingly varied, ranges from grey, brown, tan, yellow and orange. They also have leaf-vein like lines on their body. So that the leaf-tailed gecko can easily mimic a dead leaf. The satanic leaf-tailed geckos are nocturnal reptiles. 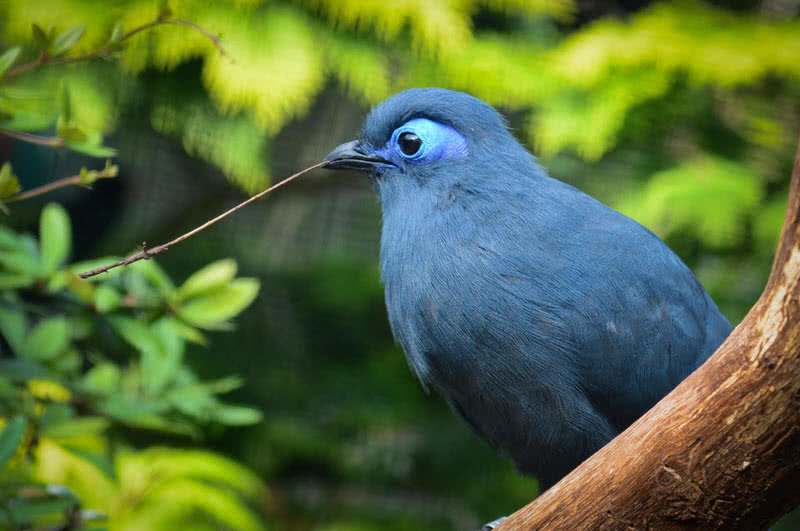 During day hours, they rest on tree branches or lie motionless over the dead leaves. They will blend into these surroundings in no time with their unique body shape and spectacular variability in coloration. Thus, the satanic leaf-tailed geckos can avoid the threat from potential predators like birds and snakes. The camouflage is not the only technique used by the satanic leaf-tailed geckos to avoid the threat. On facing a predator, they show off the brightly red colored mouth by open their jaws widely. In addition, they also display an erect tail. 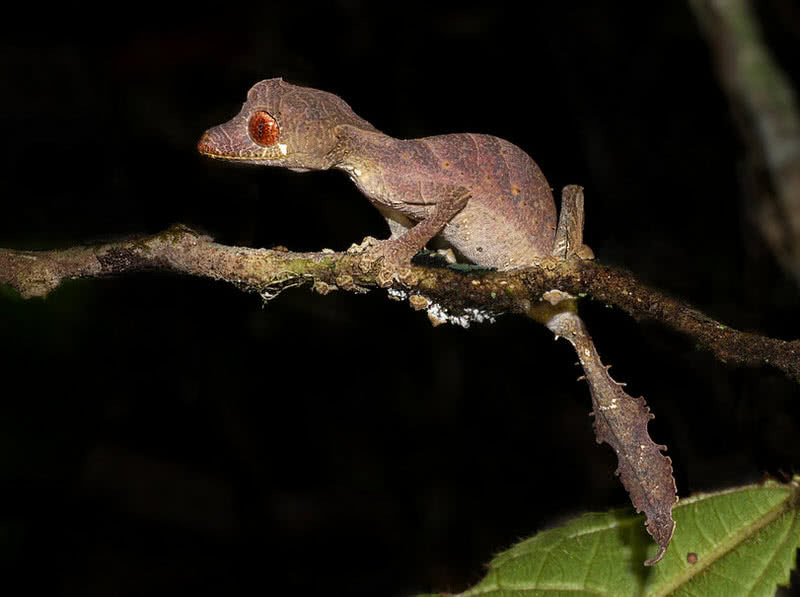 Thus, the satanic leaf-tailed geckos can confuse the predator and can escape from its sight. Madagascar is among the most important biodiversity hotspots in the world. It has been an isolated Island for more than 70 million years. Thus, this large Island became home to many unique species of animals and plants. The majority of all plant and animal species found in Madagascar is found nowhere else in the world. So it is truly a paradise of amazing plant and wildlife. Please free to share your thoughts on ‘wildlife in Madagascar’ in the comment section below.